Today's card is very different for me. No CASness here. Nope. 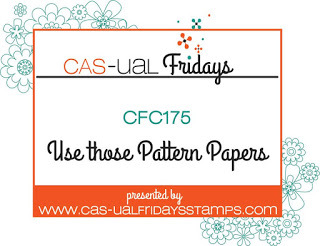 Instead I went wild with the patterned papers. Miss Ella (from Mama Elephant) and her party hat are paper pieced and popped up against some super fun and busy papers. Don't they just scream celebrate? I also added gems all over the place for even more pizzazz. I'm going to play along with the birthday challenge at The Paper Players, the patterned paper challenge at CAS-ual Fridays and the Anything Goes challenge at Simon Says Stamp. Your paper pieced ellie is too cute Jen! This is a fun card! Cute card Jen, love that paper!! Thanks for playing along with us on the CAS-ual Fridays challenge blog. Pizzazz is right! This is the perfect party card. Adorable card! Such a sweet image! Love the deign and pretty paper! Just adorable! 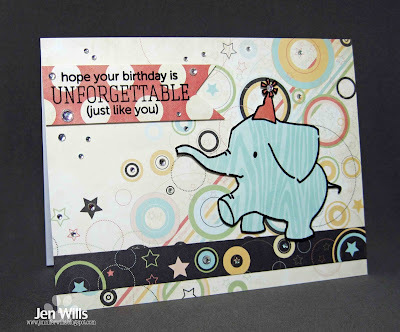 What fun papers and fun-ner elephant! 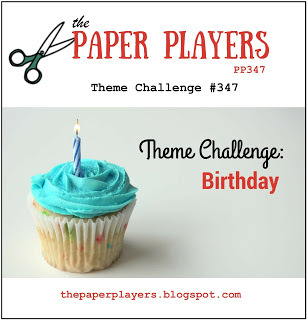 So happy you shared this with us this week for our birthday challenge! Wow what a way to step outside of your comfort zone with this super cute card!